We all love the warmth and cozy feeling we get from our outdoor fire pits. But everyone who knows the beauty of fire is also aware of how destructive it can be especially when not managed right. Heat from your fire pit can cause damage to your grass or deck is extra precaution is not taken. This is why along with your outdoor fire pit; you should get a fire pit mat or deck protector to keep your wooden deck or lovely lawn from getting heat damaged. These mats are made with materials that are heat resistant which ensures the safety of the surfaces under your outdoor fire pit. There are different criteria to consider when picking out one. Here are some of them. Shape and Size: Fire pit mats come in a variety of shapes. Some are rectangular while others are circular. While the shape isn’t always a challenge, the size of the mat in relation to your fire pit is quite important. Made with Z-flex Aluminized technology, this protective fire pit keeps your deck or grass from getting damages by reflecting the excess heat and also provides maximum protection against burn from flames and hot charcoal. What you get when you buy Newtex Firepad is military grade protection for your deck yet at a very cheap price. The technology behind this fire pad is the same as what is used in military aircraft and other equipment to protect them from heat and fire. There are two varying sizes of this fire pad available. There is a 16” diameter size and the other is 24” in diameter. It also has a reflective silver surface which provides extra protection. This side of the fire pad should be placed facing up towards the fire pit. As an extra precaution to ensure durability and long-term usage, at least an inch of space should be left between the fire pit and the pad to prevent damage by direct heat. 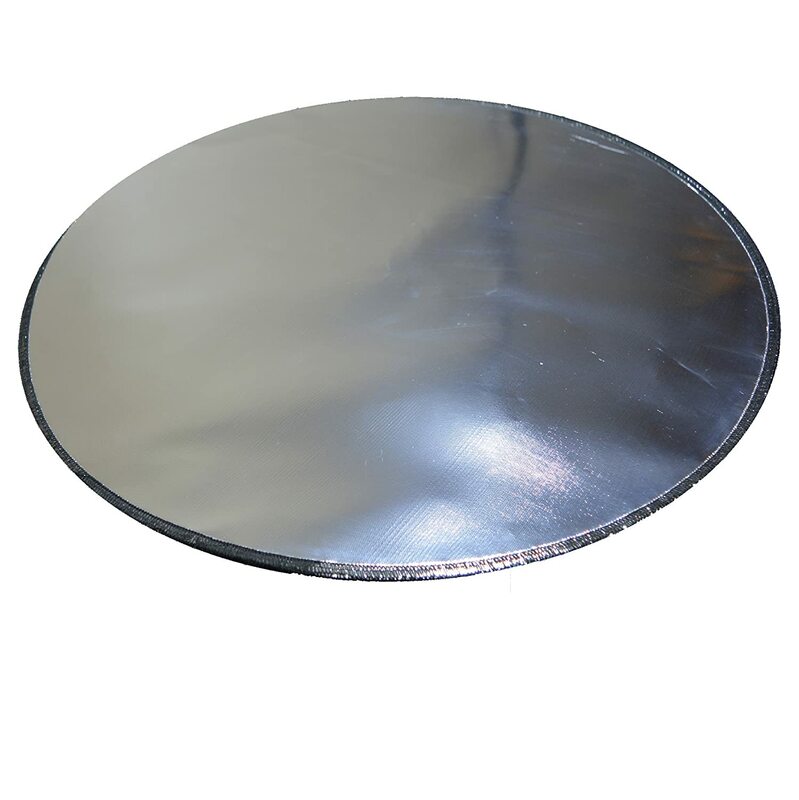 This top quality handcrafted all-metal fire pad is designed to provide protection against soaring heat as hot as 1500O F. Northland Deck Defender works based on three effective scientific principles, the same principle employed by NASA for keeping space crafts and suits insulated) to ensure maximum protection against heat. It comes with a shiny metal surface which reflects heat. It is also made from aluminum which is an effective heat sink and is constructed with multiple layers of metals that have air space in between them creating a natural insulating effect since air is a poor heat conductor. With all of these, you can be rest assured of maximum protection for your deck or patio at all times. Available in a number of sizes, the Deck protect Fire pit mat is made from volcanic rock fibers which have been woven together with layered carbon fillers to not only protect against high temperature from your fire pit but to also withstand the elements without rotting or suffering any other type of damage. You also don’t have to worry about the deck getting damaged by rusting since it is made from heavy grade aluminum that is highly rust-resistant as well. This perfect combination of materials makes it possible to burn your chimeneas or fire pits on your deck or lawn to temperatures up to 1400 degrees, well above the expected maximum of 1200 F. And at the same time not have to worry about damage from outdoor use as well. With the Infinite Heat solution fire pit mat, you can burn away on any combustible surface without having to worry about damage from the excessive heat. Hand-made from volcanic rock which has been fire woven into threads, this fire pit mat has been designed to stay strong and withstand damage by all kinds of weather, ensuring durability come rain or shine. 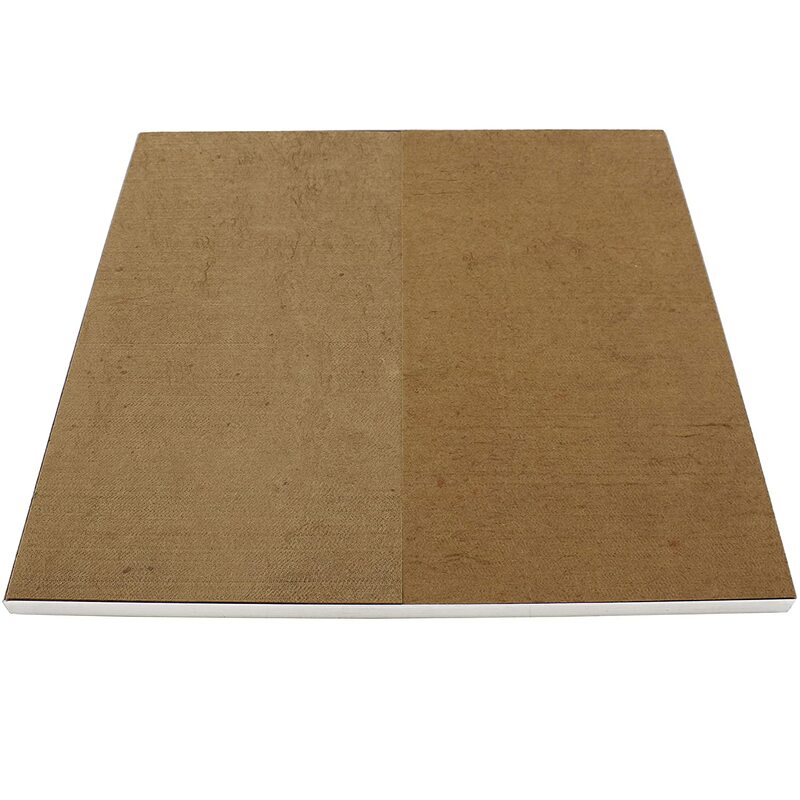 You can rest assured that both this fire mat and its rack have been made from the finest materials which whose integrity will not be compromised by heat or get rusted from exposure to weather elements. There you have it a list of our best heatproof fire pit mats recommended for your wooden deck or grass. With any of these fire pads, you can confidently enjoy the warmth of your fire pit without fear of causing damage to your deck or grass.